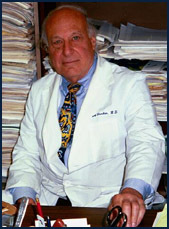 Dr. R. I. Henkin is a true pioneer in the treatment of taste and smell disorders. He mapped out the first systematic approach to diagnosing and pinpointing the reasons for loss and impairment of these senses. He devised the earliest known effective treatments for these disorders. Dr. Henkin received his medical degree at UCLA, and did his residency at the University of Miami's Jackson Memorial Hospital. From there he went to the federal government's National Institutes of Health in Bethesda, MD where his research into problems affecting the senses of taste and smell began. He worked with and among other nationally recognized clinical researchers at NIH, and was chief of the Section on Neuroendocrinology in the National Heart and Lung Institute. He left NIH in 1975 to become Professor of Neurology and Pediatrics, Director of the Center for Molecular Nutrition and Sensory Disorders and Clinical Director of The Taste and Smell Clinic at the Georgetown University Medical Center. There he developed a program devoted to the anatomy, physiology, and pathology of the senses of taste and smell and to the physiology, biochemistry and pathology of saliva and nasal mucus. In 1986 his program entered into the private sector where it is now, with research ties to NIH and to the Georgetown University Medical Center and the George Washington University Medical Center in Washington, D.C.